& Save Money in the Process! & Curb Appeal... WITH a Warranty! Invest in the Heroes of Roof-Water Management! Schedule a FREE Inspection & Estimate! Our quality craftsmanship keeps our customers coming back! Serving Roseville, MI and the Surrounding Areas, Our Home Advisor Certified and Certainteed 5 Star Rated Team Can Help Transform Your Home! At Vinyl Solutions, we offer superior vinyl siding repair and installation, vinyl replacement windows, new roof installation and clog-free gutters throughout St. Clair Shores, Warren, Birmingham, Royal Oak, Grosse Pointe and the surrounding areas. As one of the top vinyl siding installers in MI, our contractors have a wealth of experience working with Wolverine, Certainteed, Alside, and Polar Seal products, and have been proudly serving homeowners like you for over 18 years. Our siding contractors are fully licensed and insured, so we invite you to get in touch with our skilled team for your siding, window, roof, and gutter needs today! We know that your home is the most valuable asset you own, so keeping it up to date, well maintained and protecting your family from the elements is our number one goal. Whatever your home needs are, trust Vinyl Solutions do the job right, do it quickly, and do it all at a price you can afford. Don't let an aging exterior ruin your home - give us a call now! What Makes Vinyl Solutions the Best Choice for Your Home? We come to you so that we can thoroughly inspect your home and provide you with a detailed estimate on whatever work you’re looking to have done- new siding, replacement windows, roof replacement and/or new gutters. We’ll not only work with you to identify the best color options that suit your home, we’ll also make recommendations on products that best fit your budget. We’re in the business of helping and not trying to talk you into products and services you don’t need. We also offer a 15-year warranty on all labor, so if anything needs fixing or replacing as a result of our installation process, we have you covered. That’s OUR workmanship guarantee! 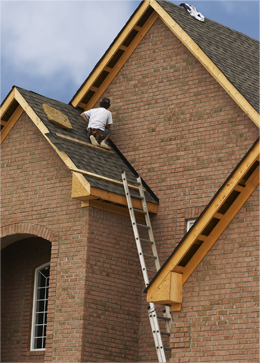 Contact Us Today to Get a Fast, Free Quote For All Your Siding, Roofing, Windows and Gutter Needs! They did a fabulous job on our siding, trim and gutters. The installers were very professional and the job was better than we expected. The price was also very reasonable. We would highly recommend Vinyl Solutions to our friends and family. Vickie M.
The contents of this webpage are Copyright © 2019 Vinyl Solutions. All Rights Reserved.